Toronto Vegan Social Events is back with another event, and this time it's open to the public! Leave your wallet at home, everything is included with your ticket. 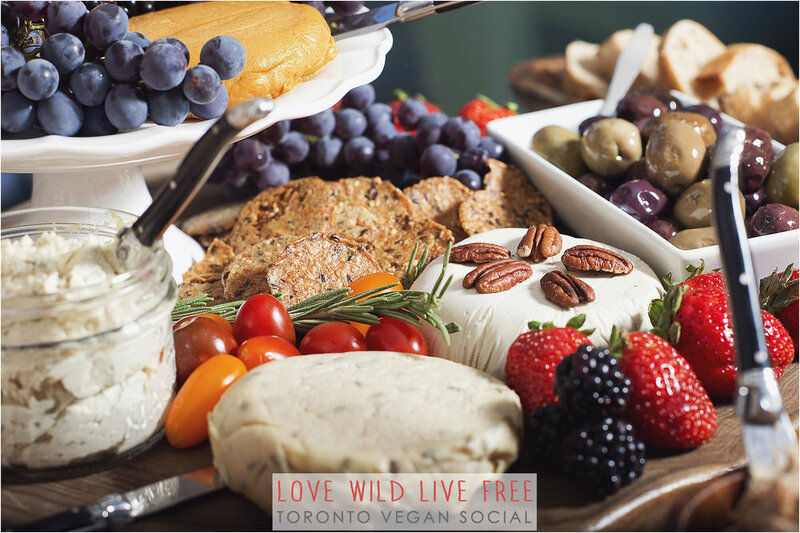 Join Vegan Social Events, by Love Wild Live Free, for an exclusive vegan food + drink tasting and yoga event. Love Wild Live Free has partnered with Tiké to host this event benefiting Community Living Ontario, a not-for-profit organization that supports individuals with intellectual disabilities. Tiké founder and yoga instructor Tania Koulakian will be leading a by-donation gentle flow yoga class prior to the social portion of the evening. This social event will bring together influencers, media makers and the local vegan and yoga communities for a celebration of Toronto’s thriving vegan scene! Special guest executive vegan Chef Doug McNish will be presenting a cooking demonstration. The event will also feature a live musical performance by professional singer, songwriter and entertainer Alexandria and DJ set by Syrus. Tickets includes admission to the event, complimentary food + beverages, PLUS a swag bag with an estimated value more than $170! For tickets click HERE - limited quantity available! Keep reading to the end of this article to learn how you can WIN one of three early-bird ticket prizes when you purchase your tickets before July 10th! For a full recap of the September 2016 Toronto Vegan Social Event please click here. Tiké founder and yoga instructor Tania Koulakian will be leading a by-donation gentle flow yoga class prior to the social portion of the evening. Space is limited, so make sure to reserve your spot by following this link for tickets. Tania is the founder of the local Toronto jewellery and lifestyle brand Tike, and a Yoga and Barre Fitness Instructor in the GTA. She has also worked a Digital Marketer/Social Media Strategist for Bounce Canada, and currently for Serendipity Yoga and Pilates, and Maimah Karmo. Community Living York South is a not-for profit organization that provides support and services to individuals (including children, youth, adults and seniors) who have an intellectual disability and to their families. The agency provides a comprehensive suite of services that support people in directing their own lives and promote self-sufficiency, increased opportunities, partnerships, well-being, freedom and meaningful participation in the community. Tania has been sharing the benefits of yoga with the members of Community Living since 2014. She is proud to support the important services that this organization provides and she believes that all people, regardless of background, should have access to the practice and benefits of yoga. The venue for this event is presented in partnership with Shecosystem Coworking + Wellness, a coworking community and event venue where feminist entrepreneurs can succeed in business without compromising their wellbeing. Whether you want to drop in once a month or every day, they’ve got a membership plan to suit your needs and a workspace to suit your mood! Leave your wallet at home because all of the food and drinks at this event will be complimentary. Come taste the best from vegan restaurants and food companies like Unbaked Cake Co., Two Bears Coffee, Culcherd and Ripple Foods. Kupfert & Kim will be joining the event again this year with their delicious wheatless and meatless eats. RawFoodz will also be back and debuting their NEW Chocolate Pudding. It's made with just 5 ingredients and is nut-free, soy-free, raw, super clean, deliciously decadent and creamy. I gave it a try and it is phenomenal - you won't believe it's vegan and healthy. Mama Vegan will also be joining the social with vegan honey and Greenhouse Juice Co. will be serving up their refreshing cold-pressed organic juices. Keep reading for a complete list of Food + Drink Sponsors below. A selection of raw vegan artisanal cashew cheeses by Zengarry from the September 2016 Toronto Vegan Social. Photo by: Impact Media. We've got all of the entertainment covered for the evening! Chef Doug McNish will be presenting a dynamic cooking demo and guests are invited to learn from the best and sample his vegan creations. Everything that Chef McNish crafts is inspired by the highest quality plant-based ingredients, grown by conscious farmers. He serves fresh food and inspiration out of his Public Kitchen. You can also find him at the weekend Evergreen Brickworks Farmers’ Market. Chef McNish is an award winning cookbook author. His first book “Eat Raw, Eat Well, 400 Raw, Vegan, and Gluten Free Recipes” received the award for “Best Vegetarian Cookbook in the World, 2012” and his third book “Vegan Everyday: 500 Delicious Recipes” received the award for “Best Vegan Cookbook in the World, 2015” by the World Gourmand Cookbook Awards held in Paris, France. To learn more visit: dougmcnish.com. Alexandria will be joining the entertainment line up with a special musical performance. Hailing from Toronto, Alexandria is a professional singer, songwriter, and entertainer that is often referred to as having a voice that soothes the mind, heals the body, and touches the soul. Her song Lost, a collaborative effort with the UK’s Frequency & Soul Circuit, was featured in an episode of American Horror Story, as well as in a Mercedes Benz ad campaign that has run worldwide. Her original composition, Without You, was the subject of a full vocal sample on Adventure Club’s latest release Black + Blue. Alexandria is also an accomplished yoga teacher and healer, creating both the NULOVE and Zen Dogs Wellness brands; two endeavours that bring together the power of yoga, and music. The Yoga + Toronto Vegan Social Event - “Eat. Breathe. Love.” will feature a special musical performance by professional singer, songwriter, and entertainer Alexandria. The social will include a DJ set by Syrus. Although classically trained in piano, he has grown up infatuated with electronic music, and the concrete jungles that inspired its existence. Syrus has performed at a range of venues both clandestine and public locally in Toronto, and internationally in Calabria, Italy. Recently opening Team Awaken, a company that blends Live DJs, Fitness and Yoga classes, Syrus is bringing electronic music to a whole new level of enjoyment. Noticing segregation between fans from one genre to another, Syrus dreams his sets will bring all music lovers front row centre, as one. The Yoga + Toronto Vegan Social Event “Eat. Breathe. Love.” will feature a DJ set by Syrus. Join Shelby of Shelby Naturals in the healing room for a complimentary spa station featuring her vegan skincare line made with ultra-pure, organic ingredients. Shelby will be giving complementary skin analysis and sampling her cult-favourite 3-step routine, the Cleanser, Toner and Serum. These luxurious, botanical products are formulated with only active ingredients to regenerate the skin; the purest fruits, flowers and botanicals sourced from the finest suppliers across the world. Perfect for all skin types for healthy, glowing and radiant skin! Come indulge in truly organic, vegan skin care that performs. Create veggie boutoniers in an interactive demo with Beets & Roses. Fruit and Vegetable Floral Artist Beets & Roses will be setting up a unique interactive demo where guests can create complimentary veggie boutoniers. Mukta Being will be showcasing and demoing their line of socially responsible, eco-friendly cork yoga mats and yoga accessories. * This list is in no particular order and will be updated on an ongoing basis. Purchase your tickets by July 10, 2017 at 6pm EST and you'll automatically be entered to WIN one of three amazing prizes listed below! Each ticket purchased qualifies for 1 entry. Winners will be chosen by random selection and must pickup their prize at the event. For tickets click HERE - limited quantity available! Please note that tickets can only be purchased online. We reserve the right to deny entry to those who do not have a pre-purchased ticket.